By 1979, Tom Marioni had been gathering with friends, drinking beer, and calling it art for almost a decade. It began in 1970 when Marioni invited friends to the Oakland Musem of Art on a Monday, the day it was closed, to hang out and drink beer. The gathering’s detritus became the art for the museum-going public to experience. Marioni called it The Act of Drinking Beer With Friends is the Highest Form of Art, and began hosting nights of beer drinking at his studio and at hisÂ Museum of Conceptual Art. In the wake of countless bottles and hangovers, the work finally made an appearance at SFMoMA in 1979. 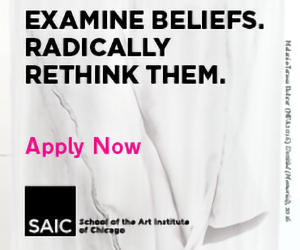 It was recently reinstalled there for the museum’s exhibition The Art of Participation. Installation view at SFMoMA in 2008. 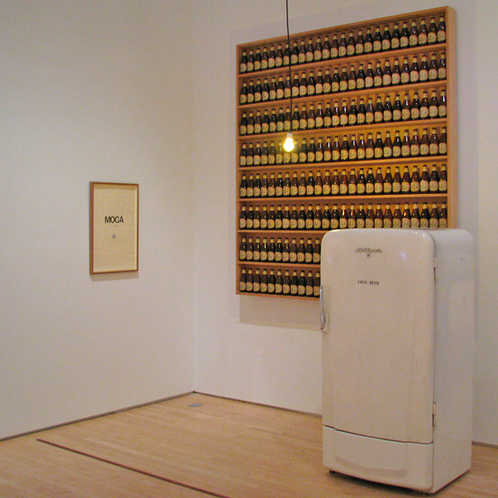 This iteration of The Act of Drinking BeerÂ took shape as a seventies-era fridge stocked with free beer, a framed poster from Marioni’s Museum of Conceptual Art, and a sturdy wood shelf mounted on the wall that displayed 200 bottles of Anchor Steam Beer. A bare lightbulb hanging from the ceiling seems to me to represent Marioni’s “eureka moment” realization that the act of drinking beer with friends, an experience common to so many local art scenes, could become the art itself. The beer served was certainly appropriate for the venueâ€”Anchor Steam Beer has been brewed in San Francisco for over a hundred years, perhaps the best known of a category of beer called California Common. It’s something of an anomaly, as most beer is sorted into one of two categories: warm-fermented ale or cool-fermented lager. California Common Beer blurs these categories. West Coast brewers in the lateÂ nineteenthÂ century brewed lager yeast warm to produce a beer that retains characteristics of both ale and lager. The result is something of a hybrid, an experiment byÂ necessityÂ that flouts traditional wisdom and tastes good anyway. Anchor also holds an important place in the history of craft beer. After the second World War, the American beer market was dominated (as it still is) by large breweries like Miller and Anheuser-Busch. 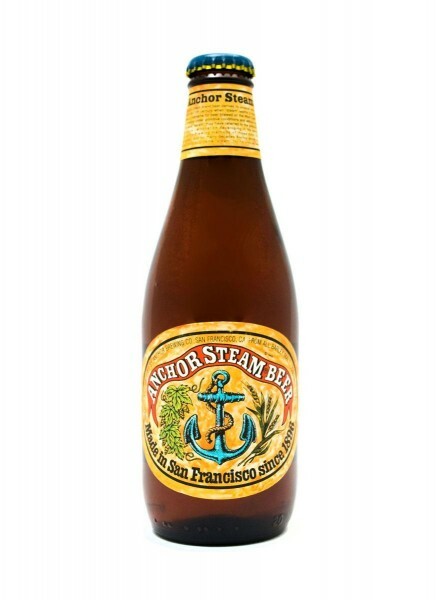 While the Anchor Brewery in San Francisco held on after the war, it did so by producing low-quality beer. Fritz Maytag III, heir to the Maytag fortune, bought the brewery in 1965 and restored it to its former glory by slowing things down and making smaller quantities of high-quality beer. It was artful, experimental, and historically consciousâ€”all hallmarks of craft brewing today. Craft beer categories are even more well-defined than categories in art. With precisely measured qualities like alcohol-by-volume, international bitterness units, and specific gravity I could describe a Pilsner in a few lines. Art Brut would likely take a few paragraphs. But craft beer also opens itself to radical mistreatments of its established standards, allowing for the birth of new hybrid categories like California Common. By refusing categories, The Act of Drinking Beer allowed the social form of beer drinking to exist as an artwork in its own right. Since Marioni’s first bottle was cracked open, a slew of artists have made artwork that takes shape around shared food and beverage. But Marioni’s expansion of art’s categorical dimensions to include social gatherings is not the most interesting thing about him. The impulse to disregard categories without permission, abandoning the urge to patrol boundaries, is what truly opens up new productive avenues for artmaking. 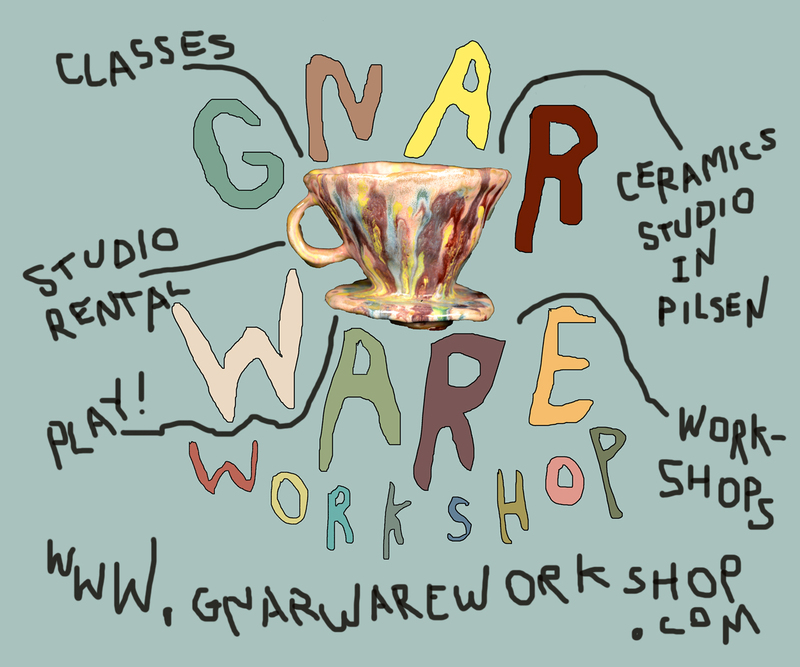 Only this kind of free-wheeling experimentation can keep art, and brewing, vital. Over the next few weeks, I’ll be conducting and posting interviews with artists that brew to try and find out what skills, qualities, and perpsectives they bring to bear on beer. I suspect that most of them brew not to plant the flag of art on the shores of beer, but to explore untapped potentials in making a beverage they’ve been led to for reasons as varied as the refrigerated stock of a craft beer store. Just as a lager yeast and an ale-style fermentation can combine to make a beer that happily exists as both ale and lager, so too can artists and brewers disregard time-worn categories and embrace the possibilities of being two things at once. That beer can be art shouldn’t surprise us. The myriad things that artists can do with beer should.